Remember the 1994 tech thriller Disclosure, starring Michael Douglas and Demi Moore? Filmed at the old Aldus offices in Seattle? (Remember Aldus?) Of course you do. One the things I liked about the film was its depiction of virtual reality. 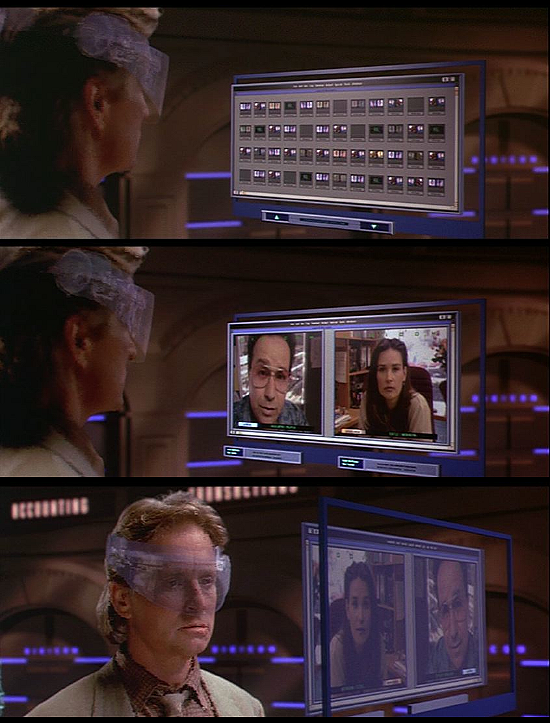 And within one of the VR action sequences late in the film, where the Douglas character is frantically rifling through archive files of Digicom video chats between the evil Demo Moore character and a Digicom manager at its Malaysian factory, we get to see an interesting depiction of a simple interface, reminiscent of, say, present-day iPhoto, that lets the user select from a theoretically vast array of video chat archives, and then play the call back, with both parties' video and audio feeds going at the same time. Well, this is what the iPhone 4 needs. At the recent Steve Jobs WWDC keynote, right near the end during the event's "One More Thing...." segment, Jobs introduced FaceTime, Apple's new video call capability built into iPhone 4. Very cool, yes, right, whatever. But what immediately struck me was that there ought to be a way to record your calls, like had been shown in Disclosure 16 long years ago (416 web years by my reckoning). Jobs made no mention of such a feature, nor does the Apple site, but geez, it sure would be handy. Of course, in some jurisdictions, perhaps all, it would be illegal, unless perhaps there were a warning at the beginning of the call that all parties making the call had to read and click an "I Agree" button for, indicating whether they agreed to the call being logged (in the cloud, for a fee, no doubt). If all parties agreed, presto, the cloud's tapes, as it were, would start rolling. Such a feature might make MobileMe worth signing up for. Are you listening, Apple?